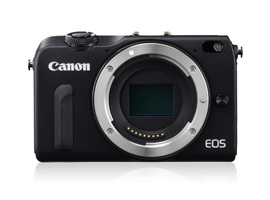 Canon was the last of the major manufacturers to introduce a mirrorless model, but rather than shy away from smaller size sensors the EOS M used the same APS-C size CMOS sensor found in the EOS Rebel range of DSLRs. In fact the EOS M adopted the same 18-Mpix CMOS sensor as the Rebel T4i (EOS 650D) and introduced a small number of lenses adopting a new, smaller EF-M lens mount. Announced late last year (December, 2013), the EOS M2 has been updated with the same Hybrid CMOS II sensor as the company’s Rebel SL1 (100D). Not only does this sensor promise up to 2.3x faster autofocusing than the previous model, but the on chip phase detection pixels cover a much larger area, up to 80% of the frame. Also new to this model is an AF Servo mode during video capture. However, the new EOS M2 has so far only been launched in China and Japan. Despite the outwardly similar shell to the original, according Canon Japan it’s now slightly smaller (by 8% in volume) while also adding WiFi connectivity for sharing and remote control using the firm’s free EOS Remote app. Other modifications include a remodeled mode dial, while the stereo microphone has been moved to the front from the rear. It also has a faster continuous burst rate, up from 4.3 fps to 4.6 fps. With a DxOMark a score of 65 points the Canon EOS M2 has a global ranking of 112 in our database overall. That’s just behind the smaller 1-inch format 20-Mpix Sony Cyber-shot DSC-RX100 at 66 points. The score is a bit low compared to rivals for a current APS-C model. Color depth and low-light capabilities are good but an 11.4 Ev dynamic range is on the low side for this sensor format. However, it’s on a par with related sensors in other APS-C size EOS models from the company. 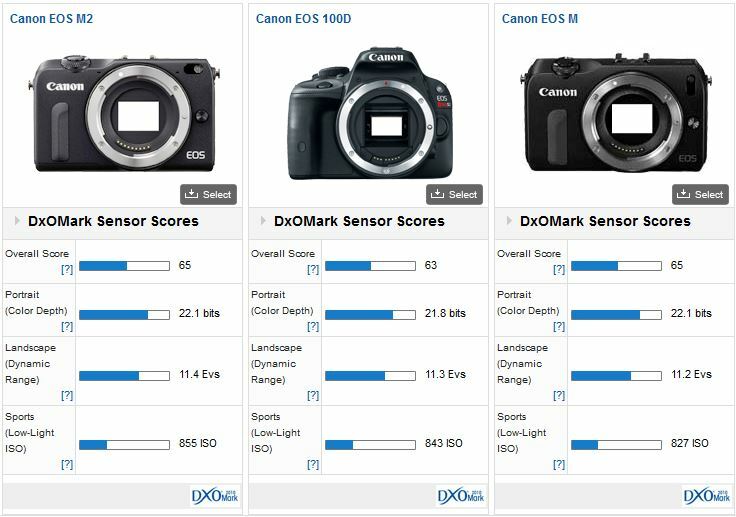 The overall score matches the firm’s EOS Rebel T3i (600D) and is just behind models such as the EOS 7D and EOS 70D at 66 and 68 points respectively. 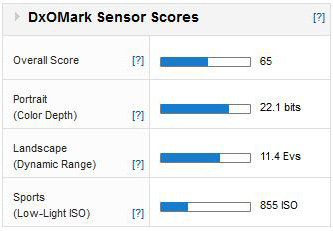 Canon openly admit the EOS M2 adopts the same sensor as the diminutive EOS Rebel SL1 (100D), so it comes as little surprise to see the two achieving similar scores from our labs. It’s also good to see that despite the addition of an indeterminate number of on-chip phase detection pixels, the EOS M2 has fundamentally the same performance as the earlier EOS M.
Things get a little more interesting when the EOS M2 is compared with rivals competing for the same target audience. 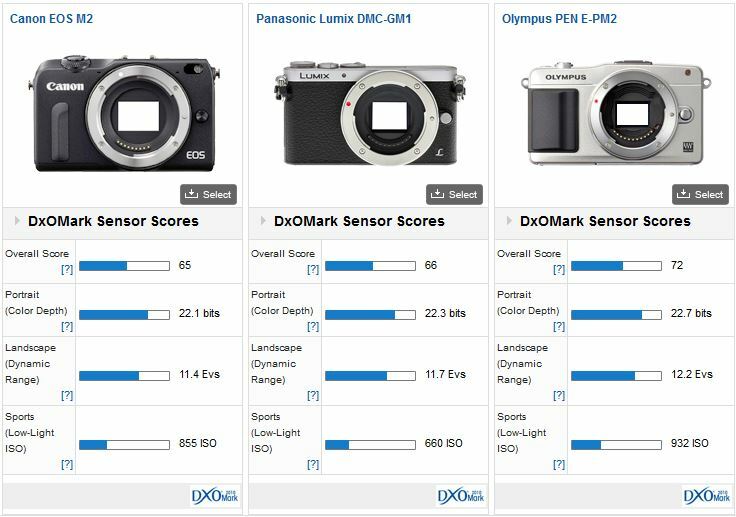 Both the new Panasonic Lumix DMC-GM1 and Olympus PEN E-PM2 have smaller MFT format sensors and yet the GM-1 performs at a similar level to the Canon. What it gains in color depth over the EOS it loses in low light (equivalent to a 1/3 stop in both cases). Although the same physical size and pixel density the Olympus E-PM2 adopts a different sensor altogether and outperforms both the GM-1 and EOS M2, albeit only marginally. Against the APS-C format Sony NEX-5T, the EOS M2 doesn’t compare that favorably, at least in the lab results. It has around -1 stop less color depth at base ISO, and a -1.6 stop narrower exposure range (dynamic range). However the Canon does well in low light capabilities though it’s technically -1/3 stop behind the Sony. 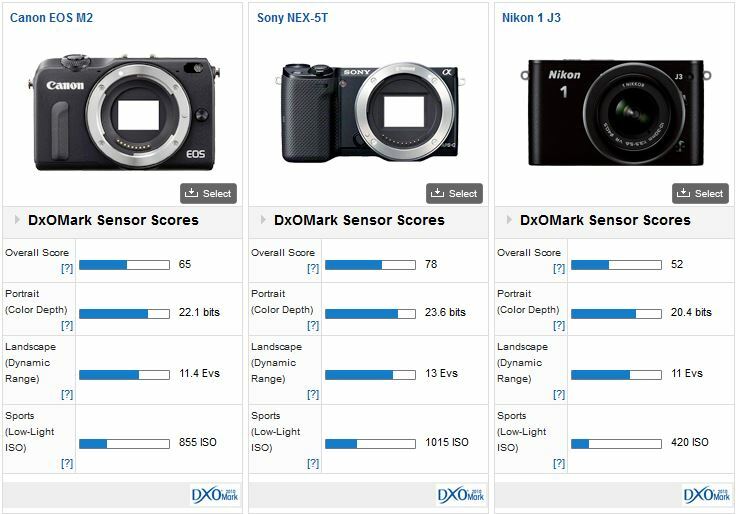 Compared to the 14-Mpix Nikon 1 J3, a camera using the same physical size sensor as the 20-Mpix Sony Cyber-shot DSC-RX100, the EOS M2 has around a 1 stop improvement in IQ overall. While it’s probably fair to say the original EOS M failed to capture the imagination of enthusiasts, the new mount has potential but it remains to be seen whether Canon will expand the range with a more advanced model aimed at more serious users. In the meantime, while it would have been nice to see the EOS M2 adopt the same sensor as the EOS 70D, it’s still an attractive option but right now it may be difficult to find on retailer’s shelves.